Spring is most definitely, finally here! The early cherries are blooming, and there nearly everything else is covered in tiny buds. On sunny days, the breeze carries the distinct scent of cherry blossoms. After a lazy Saturday recovering from a stressful week, we decided to explore a nearby lowland trail. I'd actually hiked a couple of short loops in the Paradise Valley Conservation Area with my mom and her dogs, but Andy had never been! We were both surprised by how lovely the trails were, although the shared mountain bike trails were extra muddy from all those bike tracks! It was mostly a wet and cloudy walk, but the sun did briefly come out as we made our way back to the trailhead. I was happy to see tons of trillium and fern fiddleheads poking through the undergrowth, sure signs that spring is marching ahead! Andy found this adorable 4-pack of spring ciders! The cherry blossom tasted like cough syrup, but the other were all lovely. Reading and enjoying cider from the source in the almost-sunshine at a local cidery! 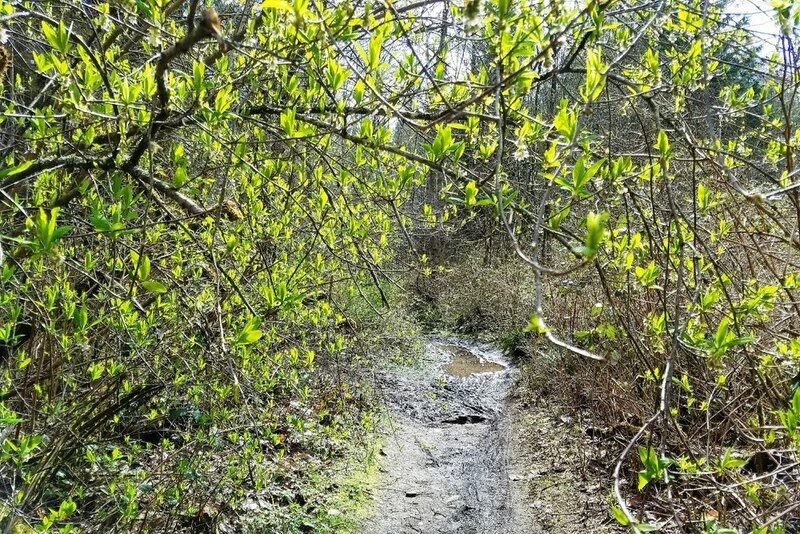 Spring trails in the PNW: tons of green and tons of mud!